In recent years, there has been much expectation that transmission expansion planning should address ever increasing demands for transmission services under significant and complex economic and regulatory uncertainties. In this article, toward meeting the aforementioned expectation, we develop and analyze a real options framework that provides the valuation of a transmission owner’s option to expand in his or her network. What distinguishes our framework from the extant literature is that the evolution of the demand follows a geometric Brownian motion process, it explicitly accounts for the physical flow of the electric power economically manifested as the locational marginal prices, and it shows how the values of the expansion options can be determined in the transmission network. Furthermore, our framework shows how to value an option to expedite or delay can be determined given that a specific expansion is planned. An extensive numerical example is presented to illustrate the key features of our framework. This is an Accepted Manuscript of an article published by Taylor & Francis as Kucuksayacigil, Fikri, and K. Jo Min. 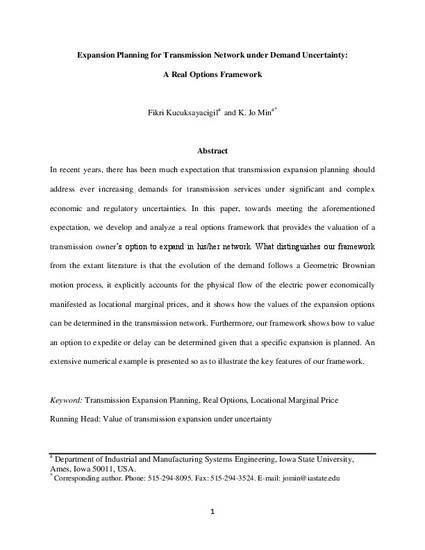 "Expansion planning for transmission network under demand uncertainty: A real options framework." The Engineering Economist 63, no. 1 (2018): 20-53. DOI: 10.1080/0013791X.2016.1256459. Posted with permission.